Yes, it’s difficult. You’ve constructed a magnificent set of levels and you feel that you’ve gotten the difficulty just right. 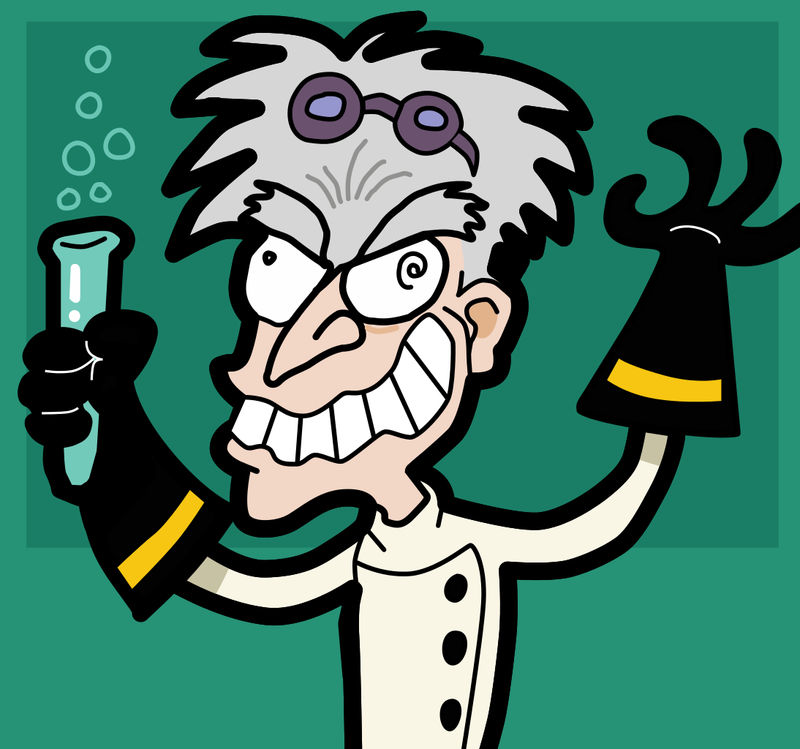 To you, your game feels challenging enough to keep the players focused, but doesn’t force them to resort to Einstein-like thinking or superhero reflexes. You then dispatch a squadron of unsuspecting play testers to tackle your newest brainchild — only to see them crumble in despair and crawl away while begging for mercy. Oops? When designing the gameplay experience, it’s all too easy to become blind to the true level of difficulty. After all, having built and tested all the levels yourself, you’ve essentially become a master of your own game. At this point, your vision may start to get distorted — what seems like a walk in a park for you, may be frustrating torment for someone else. But no worries: This is where playtesting will be your best friend. If there are any survivors from your first play test session who didn’t even get past the initial stages of the game, you could have them try out a new, way easier version. It’s also a good idea to bring in a fresh set of testers once the old group has mastered the ins and outs of your game mechanics. Besides setting the bar way too high, another common issue in games under development is the difficulty imbalance between levels. It’s not strictly required that the further you are in the game, the more difficult a level should be. Instead, a more common model adopted by many larger mobile games containing over 100 or even 1000 levels is to have the difficulty fluctuate, but still preserve an upward trend in the long run. First 3 levels of the set are fairly easy, with the first one being the easiest. If the world contains a new gameplay element, it will be introduced in the first level of the set. The last 3 levels of the set are the hardest, with the last being the most difficult. By the way, have you ever thought about why the last level in the world (or even the whole game) is so ridiculously long and tough? That’s because the last levels usually evoke a motivated mindset in most of the players. They feel like they are very close to accomplishing something big, and that only a little push is needed — even if that “little push” ends up equaling 50 attempts or 2 hours. This is where the players will be most persistent and reluctant to give up. The old saying, “so close, yet so far” applies well here. The remaining 9 levels are usually of medium difficulty, with some harder levels mixed in. They could also form their own “miniature level sets” of 4 to 5 levels inside the worlds, which have their own small difficulty curves. For example, you might have 2 easy levels, followed by 2 medium ones and last, a difficult one. The harder levels are usually there to stop the player’s smooth progress and encourage making some in-app purchases in order to be able to pass those levels more easily. However, monetization models are a whole other topic, so let’s not venture into that realm now. 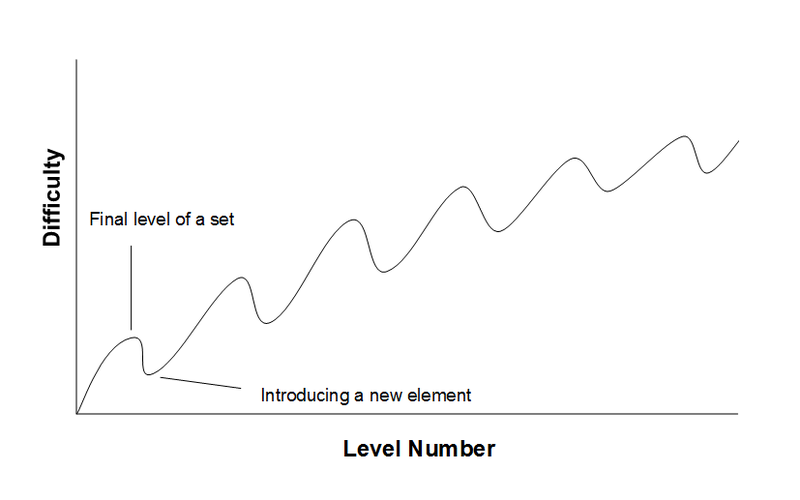 Each level set can be formed the same way, but if we compare two separate level sets with each other, the one further in the game is likely to be harder on average, e.g. 76 – 90 is more difficult as a whole than 60 – 75. While the upward trend is preserved, the difficulty progression becomes increasingly slower the further you get in the game. It has to be this way; If level 100 was “average” and 200 was already “tough”, then just how difficult do you think level 1000 would be if the progression didn’t slow down one bit? A possible difficulty for a game where the level sets end with a difficult level and begin with an easy introductory level. Notice also how the increase in difficulty becomes smaller in the later levels. The difficulty curve in my own games looks similar to the general model but is much steeper. This is simply because they consist of 20 — 36 levels. The difficulty build-up has to be faster than in a game with hundreds of levels, where it’s possible to make the first 30 levels a breeze for the player. Due to this reason, I also don’t use separate worlds. I do, however, group the levels in smaller sets, where each set begins with an introduction of a new gameplay element. These introductory levels are the ‘valleys’ in the difficulty graph, as they tend to be easier than the other levels close to them. Their only purpose is to make the player familiar with the new element. For example, level 16 in Blocky Cats introduces the teleport squares, and that level is actually easier to many than level 15, which is a tricky puzzle using an element from the previous level set: switches and disappearing blocks. In level 17 to 20, I combine the teleport squares with all elements from previous level sets, with each level being more difficult than the previous one. In Blocky Cats, level 16 (on the left) introduces the teleport, and level 17 combines the teleport with previously introduced elements: switches and red cats. Now, even if you’re aware of the level order you should be aiming for, you’re still not all clear from problems. The first of these issues is that experiencing difficulty is very subjective: What’s a piece of cake for one person may be a true ordeal for another. One factor in this matter is what kind of skill sets the players bring with them to the game. Some players have swift reflexes while others may excel in spatial reasoning and deduction. To address this, it’s best to construct a variety of challenges to test different kinds of skills — all while respecting the boundaries of the genre of your game. This will even out the feeling of difficulty for two different players in the long run, to some extent. 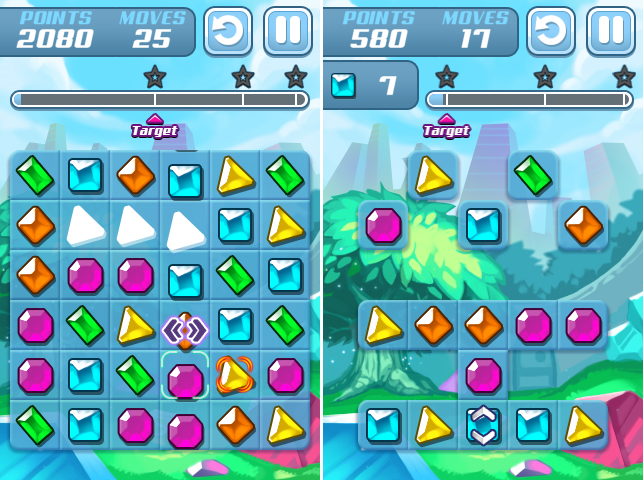 Two screenshots from Gem Slide. The level on the left has a large area that gives room to create big matches and cascades for big points. The level on the right, on the other hand, has significantly less room for maneuvering and is more about getting the right gems in the right places than achieving a high score. To shed some light on this, I’ll provide a few examples using another one of my games: In Gem Slide, some levels have huge areas that allow you to go all out and score a lot of points. In some others, the areas are much more limited and require the player to plan their moves carefully and figure out new ways to make matches. 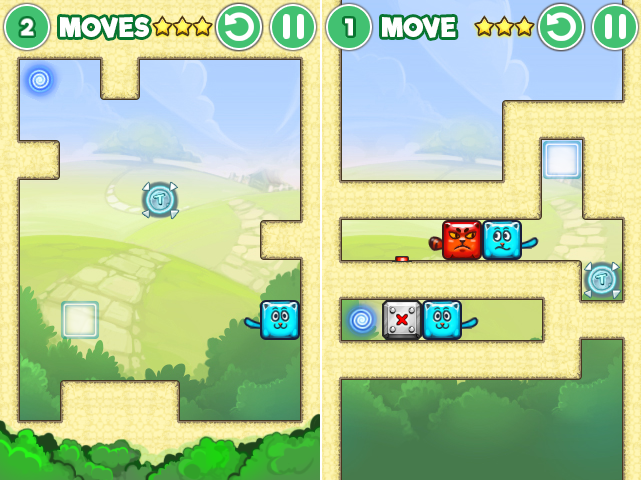 Some levels force the player to focus on a few specific squares, and some have hidden shortcuts that reward the observant players who are able to find them. The second headache is caused by luck-dependency. Also, as discussed previously, especially in the case of match 3 games, sometimes you can just get lucky and pass a level easily. You can always try to reduce the dependence on random variables and try to change the structure of the level, but depending on the type of the game, it may not be possible to completely eliminate the luck factor. Sometimes you’ll just have to accept it and live with the fact that the intricately crafted world-ending level is going to be a breeze for those lucky ones out there. Still, you may find it comforting that it’s extremely rare for someone to get lucky in all of the hard levels. It’s likely that they will have to face most of them without the assistance of Lady Luck. More often than not, even a few testers will be enough to give you a pretty good idea about where the difficulty spikes lie. However, because of uncontrollable variables such as luck and the skill levels of different players, play session data from a few testers may not always be enough, and sometimes you will need to be more thorough and gather data from a bigger set of players. In these cases, going the extra mile and adding collectors of metrics data into your game will often point you in the right direction. If you measure the number of attempts or time it takes for a player to complete a certain level or the part of it, glancing at the data will point you in the right direction. This way, you’ll catch wind of the real culprit, whether it’s that pesky boss of world 3 or the nasty puzzle in level 25. Well then, that wraps up the info package on how to find a suitable difficulty curve for your game. You are now armed to tame that difficult difficulty problem! Until next time… Stay tuned and take care!